Entirely functional with no wasted space. 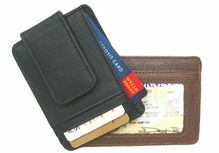 Genuine leather identification holder with clear window, includes 3 pockets for credit cards and magnetic clip to hold some cash. ID window has hole to allow easier removal or view of contents. Compartment for cards & magnetic clip for bills. Gift box included. Case: Cowhide Size: 3.00 x 4.00" Color is Black. This listing is for one item.